Review at the end, passing score, randomize questions and time limit are obviously not suitable. Leave them off or 0. After that you have to save the poll otherwise you cannot add the question. Polls could have only ONE question. This question MUST be of type choice otherwise you won’t see anything. You should have already created a question for your poll , otherwise you must do that now. 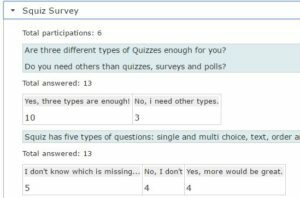 You can use the same questions as for the quizzes and surveys. User votes will be aggregated in evaluation. all others are not suitable. If you leave this empty, nothing will be displayed after voting. The frontend is driven by the template engine Twig. Examples and docs can be found here: https://twig.sensiolabs.org/documentation. All templates can be found in \[plugin_dir]\templates, every template group in his own directory. If you want to create your own, create for a new folder (name without umlauts, white spaces and special characters, only [a-z 0-9 -_]). 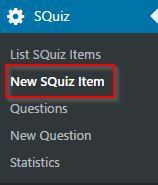 From now on you can access this new template in the SQuiz edit screen (right sidebar Templates) and you can assign it to a quiz. You must not but you can copy and customize template parts from the standard, poll or survey folder. As you can see, that the template directory name must follow the rules for valid unix filenames. This stylesheet will be loaded after the standard stylesheet, so that you can overwrite the standard styles as you like. Btw. the standard frontend stylesheet will be loaded even if you use another template for a certain quiz. Missing template files (in your custom template folder) will be searched in standard so that is a kind of overloading mechanism. You can overload or customize some parts of a template and you can skip other parts if they are okay for you. 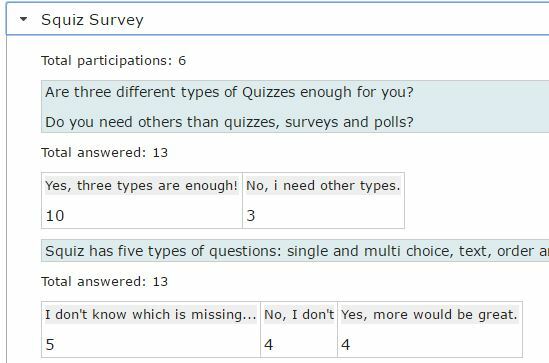 With version 3.0.0 stylesheet overloading affects all quizzes, polls or surveys grouped on one page together. That means if you have a page with two items (even if they are from different type) the overloaded stylesheet will affect both.